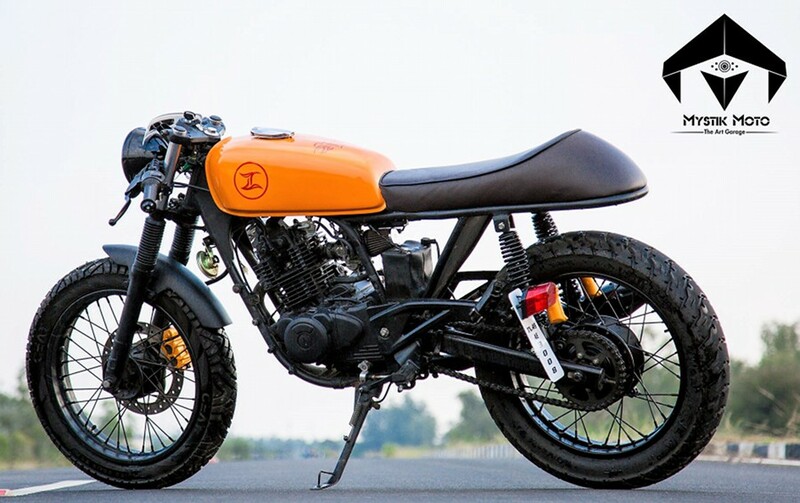 Modified Bajaj Pulsar 180 by Mystik Moto: Cafe Racers are a unique way of expressing freedom on the road. Their lean body design, single seat layout and powerful throttle response makes them truly beautiful for long drives. 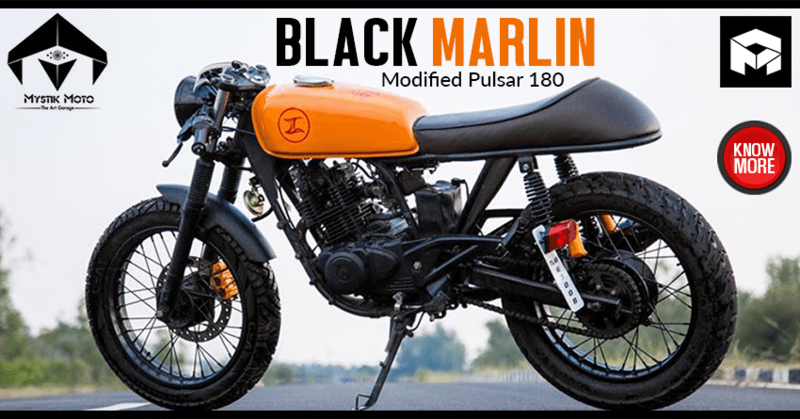 Mystik Moto achieved the same level of expectations through Black Marlin, a totally customized Bajaj Pulsar 180 that now looks, feels and even revs the cafe racer way. First half of the frame was kept intact while rear went under the scissor to achieve the flat seat look on a Pulsar chassis. They first replaced the stock fuel tank with a metal tank that runs almost in the same line as the brown wrapped seat. 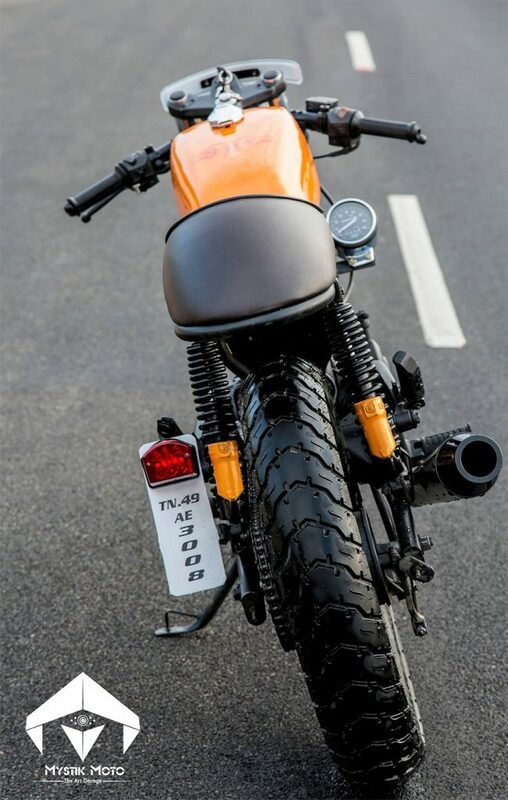 The fuel tank flaunts golden shade with pride while the same can be seen on front brake caliper and gas canister for rear suspension. Stock alloy wheels were replaced with spoke wheels that were further painted Black for better contrast. 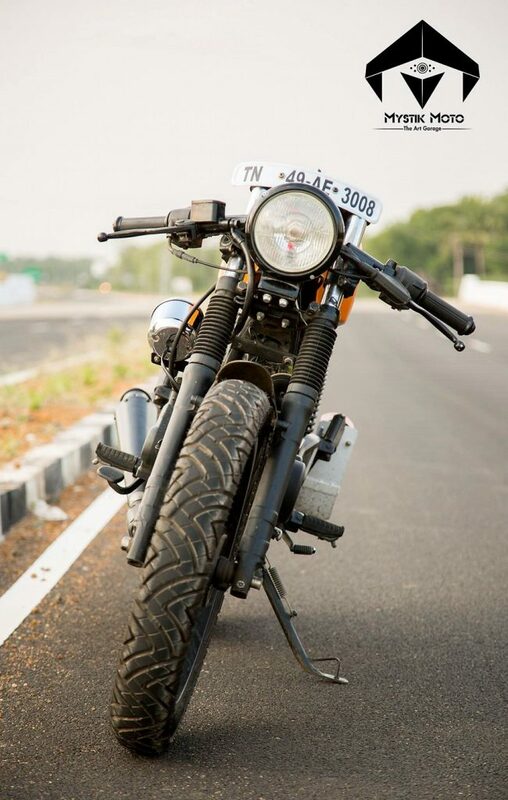 Other components on use includes a custom exhaust system, side mounted speedometer, wider tyres, almost empty headlight area and uniquely mounted clip-on handlebars. 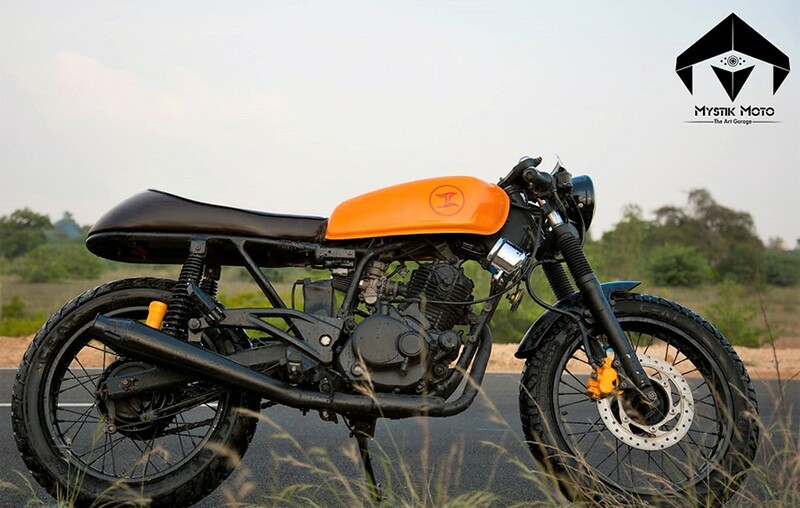 Black Marlin comes with extensive ground clearance and but still, its seating position makes the rider vulnerable to jerks when experiencing a mild off-road ride. Bajaj Pulsar 180 is powered by a 178.6cc, single cylinder engine producing 16.8 BHP at 8500 rpm and 14.22 Nm at 6500 rpm. The engine comes mated to a 5-speed gearbox. 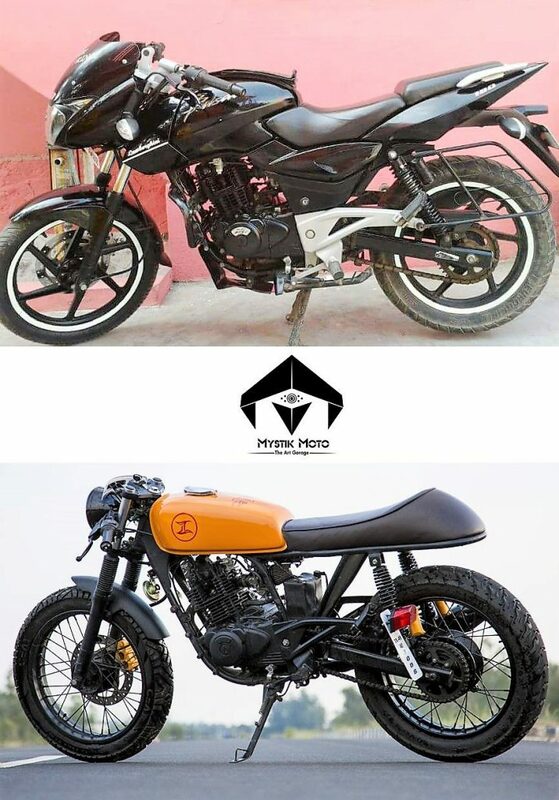 The stock bike weighs 145 kg while Black Marlin uses all metal parts and would have gained some lean muscle through heavier wheels and other modifications. Even the tyres now weigh more through bigger tread. 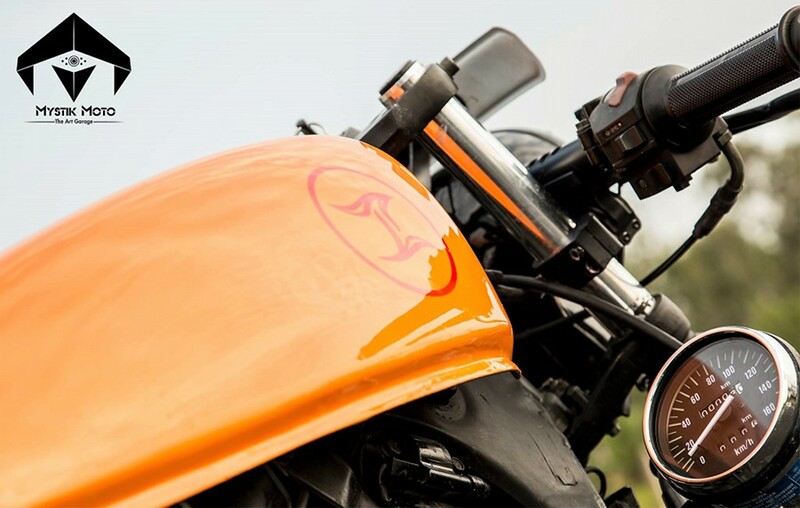 Mystik Moto has precisely finished every part and proudly used their logo on both sides of the fuel tank.